AbortionProcedures.com is a new web site featuring former abortion provider Dr. Anthony Levatino describing abortion procedures alongside video illustrations abortion techniques. The web site features videos on D & E (Dilation and Evacuation) abortion, aspiration abortion, the abortion pill, and induction abortion along with question and answer videos with Dr. Levatino. Below is the video of a D & E abortion which is a commonly used abortion method in the 2nd trimester. Legislation to ban this procedure (in which a child is dismembered) has been introduced in Michigan. The Spring 2016 issue of the RLM News is now online. You can read articles about the 43rd Annual March for Life, a local affiliate victory over Planned Parenthood and looking forward to the 2016 elections. Groups that favor legal abortion often call themselves “pro-choice” but more and more they’re revealing the only "choice" they favor is abortion. The group NARAL (National Abortion Rights Action League) provided an excellent example of this recently. During Super Bowl 50, one of the commercials paid for by Doritos featured an unborn child who really wanted the Doritos his or her father was eating during an ultrasound appointment. You can watch the commercial below. Here’s NARAL’s reaction on Twitter. They didn't like the ad because it supposedly used the "antichoice tactic" of "humanizing" a late stage human fetus. The main problem with NARAL's position is that it's not a "tactic" to humanize unborn human children. It's merely acknowledging a scientific fact. Unborn human children with human parents are human. It's also disturbing how NARAL opposed "humanizing" an unborn child which is clearly near birth. Apparently, even an unborn child at the very late stages of pregnancy isn't human to NARAL. Pro-abortion groups have often struggled with how to deal with the improvements in ultrasound technology which have provided us with a clearer window to the womb. They can't argue against the humanity of the unborn so they pretend it doesn't exist. It was taken by JD Mullane, a news columnist for the Bucks County Courier Times, showing the empty rows reserved for the media during the criminal trial of abortionist Kermit Gosnell. 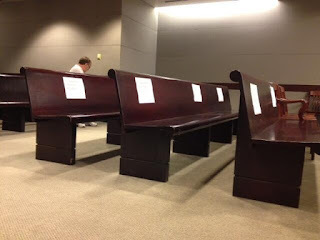 When America’s most prolific serial killer was on trial for multiple murders and the jury was hearing horrific details of what occurred in Gosnell’s abortion clinic, the media didn’t bother to show up. However, the media was highly interested when prolife activist/citizen journalist David Daleiden went to the Harris County courthouse yesterday to merely post bond after being charged with using a fake driver's license to go undercover into Planned Parenthood. Daleiden was offered a plea deal to received only probation which he turned down. 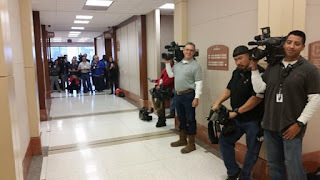 Below is a picture taken by Phil Archer, a KPRC Local 2 Reporter, showing the hallway of the courthouse filled with media. Archer also posted a video which shows media personnel with at least 7-8 large video cameras and numerous others taking photos. This is a prime example of media bias. When the media thinks a story will show abortion providers in a bad light, the media are nowhere to be found but when they think a story will hurt the prolife movement, they show up in droves. While Planned Parenthood has been giddy about the charges filed against Daleiden, if Harris County prosecutors go forward with these charges, Planned Parenthood executives will be subpoenaed to testify and the videos of Daleiden's undercover work will become evidence. The Center for Medical Progress has released a new video with various clips from their undercover investigation into Planned Parenthood Gulf Coast. The clips show how Planned Parenthood invoices researchers and uses "per consent fee" in the invoices for fetal tissue. They also charged an annual administrative fee to provide fetal tissue to researchers. They also released a video of a conversation with Planned Parenthood Gulf Coast CEO Melaney Linton.